It is amazing how many different spelling options there are for what is basically a pretty simple dish. Is it baba ganoush or ghanoush? Or possibly ghanouj? However you spell it though, it's very tasty. Traditionally a baba ganoush refers to a recipe consisting of roasted eggplant blended together with tahini and various spices and it's a typical appetizer or mezze plate in Middle Eastern cuisine. It's quite easy to make but you can also find pre-made containers of it in large markets that also sell hummus and tahini. Eggplant can sometimes get a bad reputation for being bitter. Not all the varieties are bitter, of course and there are methods of dealing with the bitterness when it exists. But if you've been scarred by the taste of a bitter eggplant, you might be shy about trying baba ganoush even when promised that it is not bitter. So, if that's the case or for those people who genuinely dislike the taste of eggplant, you can still enjoy this creamy dip but in zucchini form. Simply roast the zucchini as you would an eggplant and proceed with the normal baba ganoush recipe. The texture of the two vegetables is similar when roasted and both have mild, creamy flavors. Regardless of whether you like the original eggplant recipe, the alternative zucchini recipe or both, the consistency of the final dip, when using either vegetable, is very similar and the result is creamy and smooth. You can use more or less tahini depending on your preference and feel free to customize the spices a bit to suit your taste. Then grab some homemade pita chips and start happy snacking! Pre-heat the oven to 400 F..
Slice each zucchini in half, lengthwise, cut off the ends and drizzle on the olive oil. Place on a baking sheet lined with parchment paper and roast in the oven for 30 minutes or until the zucchinis are fully soft. Allow the zucchini to cool enough to handle and then scoop the flesh out of each zucchini half. Add the flesh to a food processor along with the garlic clove, tahini and lemon juice. Puree the mixture until smooth. Then stir in the chopped parsley, salt, pepper and red pepper flakes, if using. 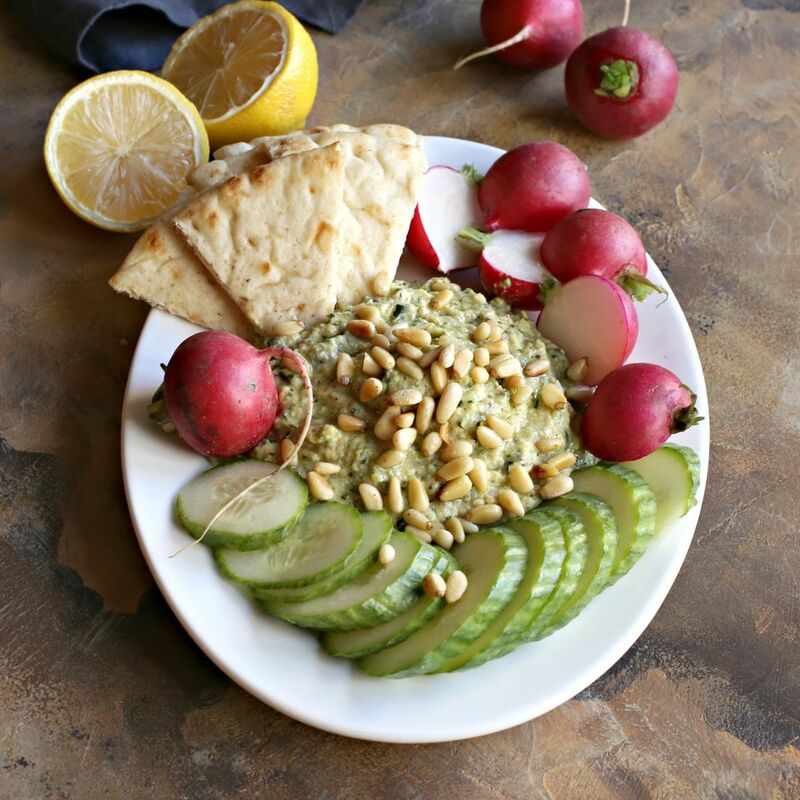 Serve with the toasted pine nuts along side pita bread, naan or other flatbread for dipping.